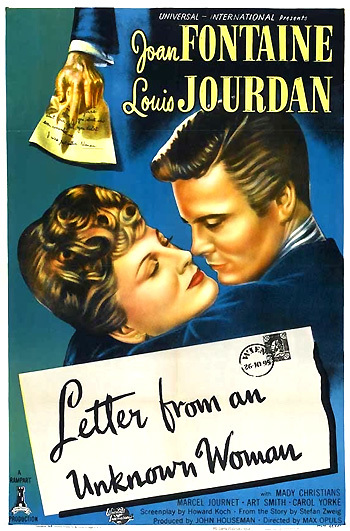 It demonstrates his lyrical, gliding camera movements, long tracking shots, atmospheric melancholy and romantic dialogue, the recreated flavor of turn-of-the century Vienna, and the exquisite acting talents of its delicate blonde heroine - portrayed by 31 year-old actress Joan Fontaine. The film's literate screenplay was written by previous Academy Award winner Howard Koch (screenwriter for Casablanca (1942)), and adapted from a 1922 short story (novella) by Stefan Zweig. [Note: An earlier pre-Code film Only Yesterday (1933), starring Margaret Sullavan and John Boles, was based upon the same story.] Joan Fontaine's own production company produced the film. John Houseman, Orson Welles' former partner and the uncredited co-author of Citizen Kane (1941), was the film's producer, through Rampart Productions (a company owned by William Dozier and his wife, actress Joan Fontaine). Although the film was not a commercial success upon its release and criticized as sentimental soap-opera, it attained well-deserved status as one of the greatest films of its kind. Its cyclically-told tale of romantic yearning and pining for love was about an imaginary romance, embodied in the doomed, delusional (and illusory) relationship of the two romantic leads: a young neighbor girl's (Fontaine) steadfast, sacrificial love for a self-absorbed, frivolous dilettante concert pianist (Jourdan). A seduction led to an unexpected pregnancy, and then to marriage to another. Both faced an inextricable impasse and experienced numerous missed opportunities over a span of twenty years - and ultimately failed to attain true romance. The heart-breaking tale of their relationship was communicated through flashbacks and the night-time reading of the deathbed letter written by the dying woman - she was the wife of the man the pianist must duel at the coming dawn. During a rainy night, a horsedrawn carriage with three men inside winds from mid-screen to the left - along a cobblestone street lined by gaslights. From the left to the right, a man with an umbrella runs up the street - counter to the direction of the carriage. One of the occupants, who leaves the carriage, stands in the rain and speaks to the other passengers while avoiding their gaze. He is on the eve of a duel - scheduled for only three hours later. He admits nonchalantly: "I don't mind so much being killed, but you know how hard it is for me to get up in the morning." A bell chimes twice, indicating that it is 2 am. As the carriage drives off, the men wonder to themselves: "I wonder if he'll be here when we come back." The middle-aged, refined-looking, aristocratic gentleman, Stefan Brand (Louis Jourdan) ascends a winding staircase, enters his apartment, and then assures his grey-haired, mute servant John (Art Smith) that he will not keep his engagement - as he clarifies his life's values of irresponsibility and self-indulgence: "This is one engagement I have no intention of keeping. Honor is a luxury only gentlemen can afford." Lacking a sense of duty and sacrifice, he plans to avoid the duel and hurriedly flee town in an hour in a cab by exiting through the back entrance of his apartment. He also plans to be away for an "indefinite stay." He laughs to himself: "I'm sorry I won't be here to see their faces." Serving as a delivery intermediary in the hallway, John touches Stefan's arm to interrupt his departure and get his attention. He then shows him an envelope [a "letter from an unknown woman"] - un-noticed and forgotten in the rush, but placed and served on a silver tray - it came during the night. He tosses the thick envelope onto his desk, pinches the corners of his tired eyes, picks up the envelope, walks to the bathroom, opens the envelope and unfolds the many pages of the letter, and splashes water on his face from a small washbowl. His startled attention is turned toward the letter when he sees its letterhead from St. Catherine's Hospital, and its ominous first statement in a female's handwriting: "By the time you read this letter, I may be dead." His brow furrows (with beads of water) as he picks up the letter, turns, and dabs his face with a towel. He proceeds into his study where he places the letter on a desk, lights a small lamp, and then leans over to read it. By the time you read this letter, I may be dead. I have so much to tell you and perhaps very little time. Will I ever send it? I don't know. I must find strength to write now before it's too late, and as I write it may become clear that what happened to us had its own reason beyond our poor understanding. If this reaches you, you will know how I became yours when you didn't know who I was or even that I existed. The view blurs and fades, signifying a flashback (for virtually the remainder of the film) from the unknown woman's written deathbed confession, as she tells of her lifelong, almost 20 year obsession with a pianist and actually relives the feelings and thoughts of her life. The reading of the letter is represented by the narrating voice of the woman herself - now dead, although her voice doesn't sound labored or deathly sick. I think everyone has two birthdays, the day of his physical birth and the beginning of his conscious life. (A workman accidentally strikes a musical note on a harp.) Nothing is vivid or real in my memory before that day in Spring when I came home from school and found a moving van in front of our building. I wondered about our new neighbor who owned such beautiful things. Significantly, the first spoken words in the film's first flashback identify and introduce the 'unknown woman's name' - they are called out as a summons by the young girl's mother (Mady Christians) from a second-story window, to get her daughter to stop her dreamy contemplation of the delivery van: "Lisa, come in Lisa. Come in this minute, you hear? Lisa!" [From the previous voice-over, it is clear that Lisa identifies this day as a birthday - the beginning of her conscious life.] After climbing the stairs, Lisa meets the occupant's mute assistant John, just as she hears her mother call her name one more time: "Lisa, what are you doing out there? Come inside." I didn't see you that day or for many days thereafter, but I could listen to your playing. In contrast, a schoolgirl friend of hers thinks the playing is only "noise." Lisa gazes down at her hands, as her friend tells her that a boy at school "doesn't keep his hands to himself." Stefan's hands appear in close-up as he plays. When the music suddenly stops, Lisa abruptly stands up, and then runs through the courtyard into the building and up to the second floor, where she peers into a glass door of the pianist's apartment. Looking handsome in a fancy suit, he comes down the stairway of his place, and when he reaches the threshold of the door, she opens it for him. In one of the film's most memorable scenes, she remains paralyzed and with a look of quiet fright behind the opened door, where she timidly and shyly views him - for the first time - through the glass. He smiles at her and tells her: "Thank you." Again as he turns and looks at her before entering the street at the iron gate, he speaks once more: "Good morning." Yes, I was blushing, and hard as it may be for you to realize, from that moment on I was in love with you. Quite consciously, I began to prepare myself for you. I kept my clothes neater so you wouldn't be ashamed of me. I went to dancing school. I wanted to become more graceful and learn good manners for you. And so I would know more about you and your world, I...I went to the library and studied the lives of the great musicians of the past. Though I was not able to go to your concerts, I found ways of sharing in your success. Lisa also wistfully watches his numerous visitors from an upstairs window, noticing that his gatherings are often attended by elegantly-dressed women. And as the months went by, I began to know your friends. Many of them were women, most of them. What I really lived for were those evenings when you were alone and I pretended you were playing just for me. And though you didn't know it, you were giving me some of the happiest hours of my life. On another day as Lisa beats a large rug hung on a clothesline during rug-beating day, she notices that the musician's servant is struggling with a large, rolled-up carpet in the courtyard. After encouraging her girlfriend to assist, they help John pick up the carpet and carry it upstairs. While the servant is laying the rug in Stefan's bedroom, Lisa illicitly sneaks into Stefan's apartment and walks into and through the kitchen, into a connecting corridor, and then through glass doors into the main sitting room where a piano is visible. Trying to make as little noise as possible after shutting the door, she walks around the piano to look at the keyboard and sheet music in a holder. Behind the piano, she examines portraits of composers hanging on the wall. Awkwardly, she backs up into a large harp, and then she notices a large framed poster on the wall - an announcement for one of Stefan's concerts. When she reaches for a small pile of sheet music on a high shelf next to the poster, the entire pile falls noisily to the floor. John is startled by the noise and finds her guiltily gathering up the music on her knees. When she sees him, she stands up and darts down the entrance hall toward the front door, leaving as quickly as possible. With a smile on his face and his hands folded in front of him, John watches her escape. I can understand that you must have been startled when you saw Herr Kastner and me in the hall...Perhaps it was my fault for not telling you something about it before...You see, dear, your mother is not really old. She can have admirers, too. She can even...well...be in love with a man. Someday, you'll understand better what that means. Besides, you know how hard it is for us to get along on my small pension. Herr Kastner has a comfortable business in Linz, a military tailor. And he has...he has done me the honor of asking me to marry him. Mother?...Would we have to go to Linz? Would we have to live there?...I won't go! I won't go! Lisa runs from the room, locks herself in her own room, and as her mother struggles with the locked doorknob, Lisa is faintly heard crying: "I won't! I won't! I won't!" Suddenly, I knew I couldn't live without you. I didn't know what I had in mind or what my parents would do when they found me missing. All I wanted was to see you once more, to be near you again, to throw myself at your feet, and cling to you and never leave you. Nothing else, nothing else mattered. And so there was nothing left for me. I went to Linz. A blurred dissolve clears on the face of Stefan (fifteen years later) who is reading the letter at his desk. You who have always lived so freely, have you any idea what life is like in a little garrison town? I was eighteen now and was expected to take my place in society. The lieutenant was right. Linz was a musical town, so twice a month that summer we listened, the lieutenant and I.
Lisa (shaking her head): But lieutenant, I'm sorry. It's impossible. Lieutenant: But I certainly must insist. Is there someone else? Lieutenant: Engaged to be married? Lieutenant: The whole time you've been in Linz I haven't seen you in anyone's company. Lisa: He doesn't live in Linz. He lives in Vienna. Lisa: They don't know about it. Well...I...I only told him the truth...I told him I wasn't free. My poor parents, for them this was the end. For me, it was a new beginning.